Dr. Shepard performed a total of three surgeries on both of my children. My son, Ryan was a high school pitcher and had a torn labrum in his shoulder and my daughter Katelyn, a water polo player and swimmer, tore her meniscus and ACL as a result of a marital arts demonstration. Not only did my children have very positive results from the surgeries, they both developed a terrific relationship with Dr. Shepard. He took the time at our appointments to thoroughly explain the procedures as well as getting to know them personally. He gave Katie the opportunity to sit in on another surgery he was performing as a result of her interest in the medical field. His staff was attentive, always returning calls promptly, and our time in the waiting room was reasonable. I've recommended Dr. Shepard to at least three other people and have gotten positive feedback each time. Thank you so much. Matt K. of Foothill Ranch was 35 years old and still playing competitive soccer when he sought treatment for pain in his hip. He was surprised to be diagnosed with osteoarthritis in his hip, a degenerative joint condition that would eventually require surgery. Judith F. of Santa Ana has had two hip replacement Surgeries. 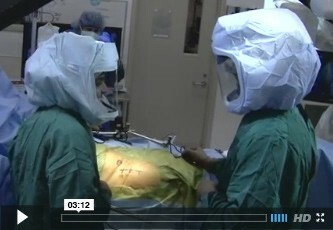 her right hip was replaced four years ago and her left hip earlier this year, this time using the anterior approach. Dr. Steve Barnett, an orthopaedic Surgeon at St. Joseph Hospital, Performed both surgeries. Both were successful, but she describes the difference between the procedures as "amazing".